The third Parent-Teacher Conference for school year 2011-2012 in my son’s school was held last Friday. I went early to my son’s school to get his Development Portfolio a.k.a. Report Card from his teacher. I was happy to see that he got mostly M’s (Mastered) this quarter and only 3 G’s (Good Progress; the second highest rating). 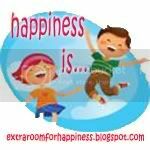 This entry was posted in Happiness Is..., Kindergarten, Mommy Moments, Parent-Teacher Conference. Bookmark the permalink. 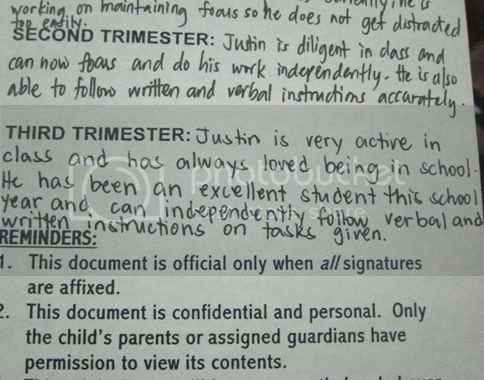 Congratulations Mommy on Justin’s glowing developmental portfolio. Glad you posted a photo of his report card. It’s great to see how report cards look nowadays. It’s quite different in our time. Wow! Keep it up little boy! These simple things makes parenting a lot more special. Visiting from MM. congrats to your son Sis, you must be one proud Mommy 🙂 reading great comments from their teacher is very wonderful for as being a Mom to that smart kids 🙂 Visiting from Mommy Moments, hope that you can return the visit too. hi Tetcha! can I ask where is Justin studying again ? how many are they in class? It is such a happiness Mommy Tetcha! as I always say, Justin is a blessing. keep it up kiddo. Congratulations for raising a very smart kid ate! Great job Justin! That will surely make one mom so proud! thanks for sharing this over at Happiness Is. see you there again for another round of happy posts. good job Justin!congrats also Mommy Tetcha for bringing up a good boy and student…truly a mom’s pride! wow..very proud mom..dapat lang! hehehe..
Yay! One proud mommy. Congrats sis! ← Join Hump Day $50 Giveaway This Week: Add Us to Your Google+ Circles!